Aim for a hole in one by keeping those golf clubs clean with this Personalised golf towel in black with metal hanging loop. Aim for a hole in one by keeping those golf clubs clean with this Personalised golf towel in black with metal hanging loop. Purpose made terry cotton golfing towel in a handy 30x50cm size that is lightweight and dries fast, ideal for the caddy bag and makes a great gift for all golfers. 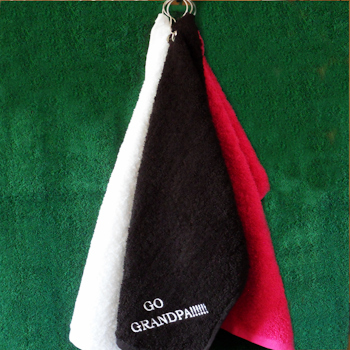 This lightweight golfers towel is a stylish golfing essential for a day on the green. Aim for a hole in one by keeping those golf clubs clean with this Personalised golf towel in black with metal hanging loop. Purpose made terry cotton golfing towel in a handy 30x50cm size that is lightweight and dries fast, ideal for the caddy bag and makes a great gift for all golfers. This lightweight golfers towel is a stylish golfing essential for a day on the green. Please enter in the option box the exact name or wording you would like embroidered and choose the thread colour and font style you want. Personalised gifts are made to order and dispatched in approximately 2-3 working days.